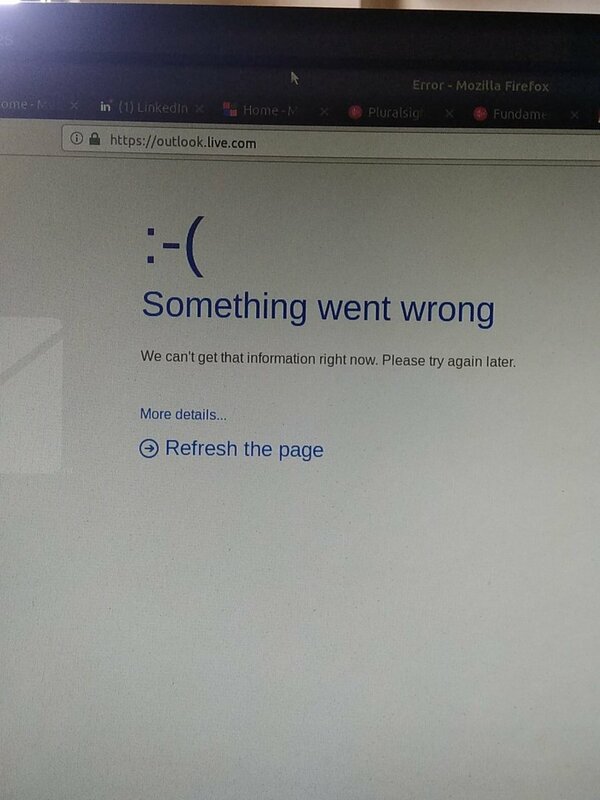 Is Outlook Down Right Now? For those using Outlook as an email client. Good article. World economic growth outlook ... decent. Don't you have an outlook to be working on...? Nothing beats closing outlook on a Friday. I don't even want to open my Outlook or any other email work platforms this weekend. #TalesFromIT Another haiku, because Friday and Outlook: Email in Outlook. AD IS DOWN! What the crap? White screen of death. Yay. I can’t get onto outlook via share point. Is there a problem or is it me? Or working in the hospital. Your outlook in life will never be the same. I have not received an email in 10 minutes. Someone call Microsoft 911. Outlook must be broken. All of the calendars that had been shared with me in Outlook are gone this morning. Anyone have any insight into how to fix this? @OfficeDev publishing to the sellerdashboard for Outlook Add-in does not work, and the support links all 404. Help! ?